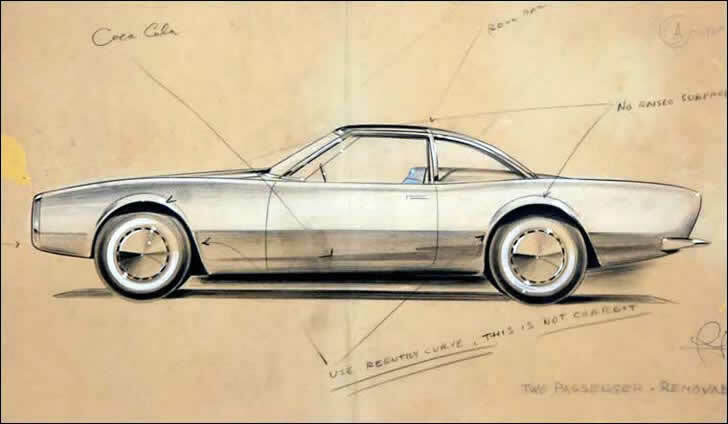 Early concept drawings for a 2-door Avanti signed by Raymond Loewy – These colored pencil and charcoal sketches on vellum drafting paper were produced in March 1961 in a two room tract house in Palm Springs, California. Loewy served as the creative director of the four man design team. His main directions to the team members were minimize chrome, avoid decorative moldings, accent wedge-shaped silhouette, stress long, down-slanted hood, abbreviate rear and tuck it under, and think aerodynamics. Objectives included placing the instrument panel overhead, above windshield as in aircraft, installing aircraft-type knobs and levers on the console, pinching the waistline, as Le Mans-type racing cars, designing hoods with an off-center panel, accenting spacecraft “re-entry curve” wheel openings, and simple disc wheels. 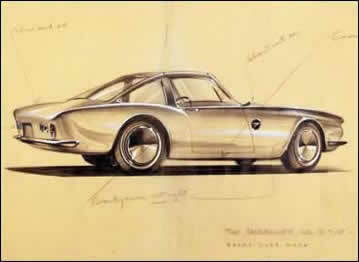 Notes were written on an early sketch for a two passenger coupe mentioning the Coca Cola shape, a roll bar, wheel opening flares, and reentry curves.